English Through Pictures, Book 3. May 2005 Edition Available from Pippin Publishers, Toronto, Canada, as a 3-volume set for US$35 or Can$40, free shipping. Paperback 4.25" x 7" ISBN 0-88751-117-1 . ENGLISH THROUGH PICTURES: BOOK 3 - 256 pages. Because Richards makes statements that he advanced the vocabulary of Basic in Book 3, I have looked into it from two aspects. How it compares to Ogden's Basic and how this edition compares with the last edition. *	Computer -- good, this is a valuable new international word that needs to be acknowledged. *	CD -- is added to disk and tape. It is treated here as a word not a an abbreviation for compact disk. Practically, we consider all capitalized words as proper nouns acceptable in Basic. This "word" is fine for contemporary use and teaching. However, consider the history of media -- piano rolls, 78s, 45s, 33s, tape, 8-track, cassette, Beta, diskette, 5-1/4, 3.5, disk, CD, HST, VCR, DVD, MP3, thumb drive. flash card -- a permanent selection is probably best made from basic words., such as record, music- record, disk, diskette for a prolonged period of time. Note that diskette is a new international word. A new word will be the fad by the next edition. TV has a similar argument. However, the word "television" was introduced by the 1973 edition. Errata : List is misprinted as "Fist" among the L's in the index. Other : The word "human" is moved from page 217 to 108. This discussion may continue later. The good point is, the book is back in print !!!. 2. The second thing was to see how Book 3 fits with Basic English. Richards had views for Basic as a fuller language, overlooking Ogden's goal of being the simplest way to learn language for daily living. Ogden sought the smallest, complete vocabulary and grammar for use as an international second language and to allow the learner to have full entry into English communication at the earliest time. That such a language is an excellent first step to go on to learn more English is fully natural. Of the 444 words introduced with Book 3 , 214 are new. Of these, 110 words are part of Ogden's defined next steps beyond Basic, so are in agreement with Basic, but not as basic Basic 850. This means about 100 words are new by Richards and are not Basic at all. The Index of earlier editions indicated the introduction pages where each word is first introduced separately for noun forms and verb forms; this is removed in this edition -- only the first use in recorded. * - Capitalized words -- 22 of the above - are proper nouns and are accepted as common to all languages including Basic. neither , nor -- why raise this for explanation when "not either one or the other" is fine. Where "neither" is not either and "nor" is used in mathematics as not or. In normal English "nor" is used only after a "neither" phrase and means "and not". These are acceptable words, but perhaps is would be better to spend time to learn the missing Basic words of the international second language. See discussion of Simple English as a further step towards full and idiomatic English after learning basic Basic and Ogden's ready lists to the Next Step. 1 . Find the number of Basic words introduced in each book. The advertising says 250, 500, and 500. Indexes say 308, 436, 444. Early advertising said, 250 each, which is probably close to correct because many of the words are derivatives of Basic roots, ie. -ing, etc. Therefore there are probably 100 other Basic words not taught -- likely to be the most difficult to make as pictures. We must make a list of these missing words for a real Book 3. This will make the current Book 3 -- which goes on with a mix of Basic, "next step", and completely new words that are not Basic -- to become Book 4. A useful Book 5 would address idiom and new generation words. Teachers and the self-teaching learners need to know what words they have to teach or learn on their own. ACTUAL is 222, 264, and 153, leaving 213 words unaddressed. The missing words are listed below. 2 . The English Through Pictures books have been so popular, teaching millions, we must determine if any of the current Book 3 words have entered the mainstream of Basic such that they should be incorporated in the 21st Century project. The first step is to include the Book 3 new words with those of other experts : Hogben, Longman, etc. in an effort to seek agreement. 3 . Make a list of current Book 3 new words so the teacher and learner know which words are not pure Basic and be cautious in their use. Add a" Richards' List" to the Supplemental Basic Lists. For the learner going on to fuller English, this point is not very important. But, Basic as an International Second Language is fixed, such that advanced words beyond the Basic will be foreign and unknown to millions of persons who have knowledge of Basic. Example: is "occupation" better than work or is "piece" better than bit ? Is "chlorophyll" more useful to replace any one of the untaught 200 of the Basic 850 words? SEE : New words and Supplementary words learned in Book 3. Basic words not addressed by the English Through Pictures Series. Some of these words are the ideas that are more difficult to put into pictures. However, I wish Book 3 had spent more time on the Basic words, rather than introducing new words : For example, Book 3 introduces "artery" and "vein" -- which are limited use words and neglects vessel,, which as blood vessel is a complex word (compound) addressing the same subject, yet vessel has more general applications. Book 3 gives a list of new medical terms, but not the Basic word medical. It gives "retina" but takes away throat. Other examples, it introduces "philosopher" yet does not have reason which is the work of a philosopher ; and many more. In other cases Book 3 makes a judgment to change the word list, giving "mouse" and taking away "rat". and giving "poetry" and not verse. It makes addition of some chemicals and takes away some metals whereas gold is more used in English than is "sulphur (sulfur)." angry, base, behavior, belief, chance, condition, cruel, delicate, disgust, event, expert, feeble, female, foolish, force, frequent, join, kind, opinion, ornament, process, regular, sad, sign, substance, sudden, tendency, violent. Without these words, the Basic Translation Dictionary -- in which the Institute has invested heavily -- will not be clear ! Supplementary - The words given in Book 3 that are from Supplementary Word Lists : Next Step 150 words ; First Supplement 350 words ; Science, Business, Verse, 300 (283) words. Back to Basic English home page. 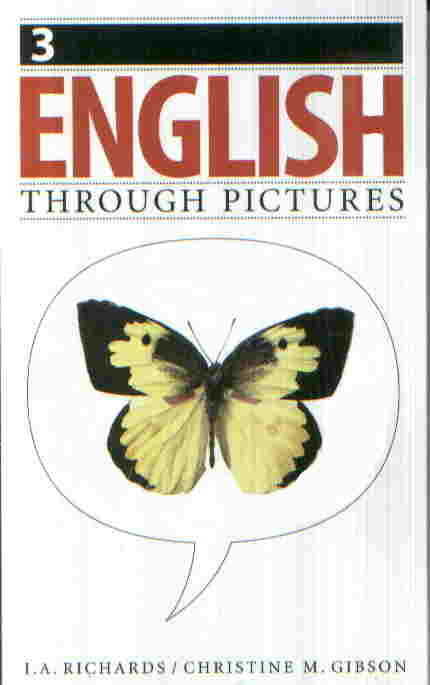 About this Page: etp3.html - Notes about English Through Pictures Book 3 ; 50 years in use.